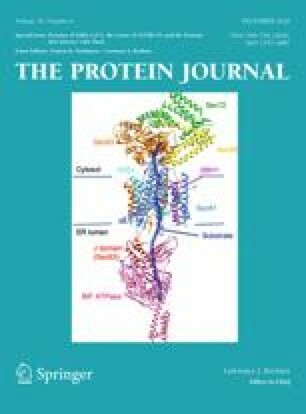 Primary structure of hemoglobin of α-chain ofColumba livia is presented. The separation of α-chain was obtained from globin by ion-exchange chromatography (CMC-52) and reversed-phase HPLC (RP-2 column). Amino acid sequence of intact as well as tryptic digested chain was determined on gas-phase sequencer. Structure is aligned homologously with 21 other species. Among different exchanges, positions α24 (Tyr→Leu), α26 (Ala→Gly), α32 (Met→Leu), α64 (Asp→Glu), α113 (Leu→Phe), and α129 (Leu→Val) are unique to pigeon hemoglobin. The various exchanges in α-chain are discussed with reference to evolution and phylogeny. The results show that the order Columbiformes is evolutionarily closer to the order Anseriformes. Since the pigeon is homogeneous, having HbA (αA-chain) and lacks αD-chain, its phylogenetic placement could be established among birds having single hemoglobin components.